Collection of 3D Vision-Oriented utilities packed in a single ROS node. PaCMan Vision (or just PACV) is a modular ROS node for robot Vision handling point cloud streams from various RGB-D sensors, like the Asus Xtion PRO or the Microsft Kinect One and republishing the modified stream to the ROS network, making it available for other nodes. The node is composed by a basic node (or bare-bone node), providing some simple and fast point cloud filters, like a cropping filter, a voxel grid downsampling and a RANSAC plane segmentation. All the filters can be modified at runtime using the built-in Qt Gui. The node has other functionalities like the possibility to dynamically change point cloud stream subscription or to save a single processed point cloud from the stream that's being republished. PaCMan Vision also introduces the concept of dynamic modules, a dynamic module is a part of the node, providing some additional functionality, you can dynamically load or kill at runtime. Each module has its own ROS node handle with its topics and services you can exploit and when you don't need it anymore you can kill the module and its functionality will disappear. 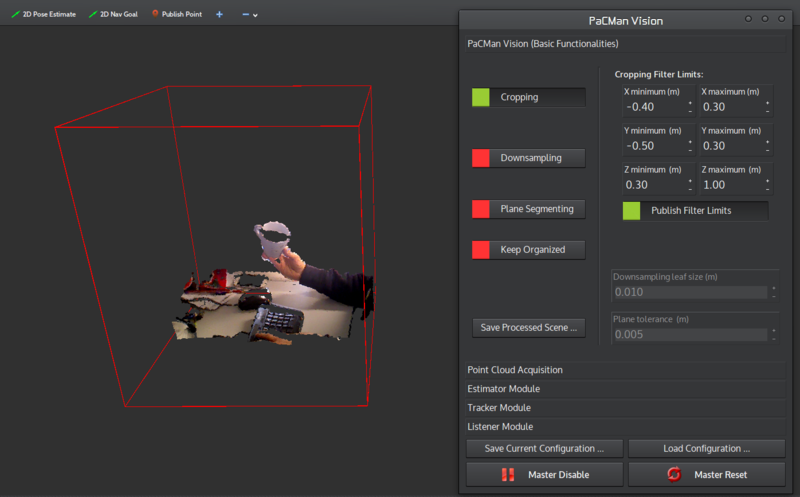 As of now, PaCMan Vision has a few modules providing object recognition and pose estimation and 3D object tracking, but it is planned to release more modules in the near future. Each module has its own section on the wiki, with install and usage instructions. Pacman_vision repository contains all the software needed to build the node, while vision_communication repository is just a bunch of defined messages and services PaCMan Vision uses You will need both to build and run the node. The reason why those two packages are separated is to provide the user the flexibility of having PaCMan Vision messages and services without actually building the whole PaCMan Vision package, thus avoiding its dependencies, while still being able to call its services or subscribe to its messages from other packages. Stream Manipulator 3D is a modular ROS node for 3D Vision, handling point cloud streams from various RGB-D sensors, like the Asus Xtion PRO or the Microsft Kinect One. It lets you modify the raw point cloud stream by applying various filters, in the order you choose, and eventually republish the modified stream to the ROS network or save it disk. It is composed by a Ros node which handles Ros communications and processing (stream_manipulator_3d) and a GUI to control it (rqt_stream_manipulator_3d). The GUI application is an rqt plugin, so you can run it by simply loading rqt and load stream_manipulator_3d from the configuration menu. NOTE: Package is still in beta and currently the GUI is the only way to control stream manipulator 3d node effectively.